LISTING FOR COAT & WAISTCOAT ONLY! - NO TROUSERS. ALLOW AT LEAST 6 MONTHS - ESPECIALLY IF FOR A WEDDING! MY SCHEDULE IS OFTEN FULL A YEAR IN ADVANCE. Ships to: UK, Canada. Please provide your postal code and I will estimate shipping. BUYERS BEWARE of knocks offs made in China! On a daily basis, we in the historical and reenactment and costuming industry are flooded with horror stories from consumers who've been duped into purchasing items "on the cheap" from China. Please know - - there is absolutely NO way that a quality garment can be produced for $99 dollars! The fabrics ALONE would cost that much or more - even at wholesale cost! See my cost breakdown below. The common and most frequent complaint we hear is that what they ACTUALLY received, was nothing like what was pictured, and the quality is worse or comparable to an inexpensive Halloween costume like those you purchase from Spirit or Walmart; and because they are in China or another international location, they were unable to return it and seek a refund. BUYER BEWARE! 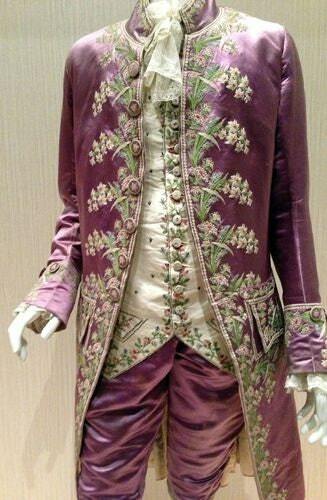 DESCRIPTION: Made To Order - Custom, Bespoke 18th Century OUTLANDER French Court EMBROIDERED TAILCOAT AND WAISTCOAT. Fully Tailored and Lined, NOW AVAILABLE! Authentically styled, QUALITY made, bespoke reproduction of this gorgeous museum piece. Limited to the sizes outlined below. DOES NOT INCLUDE MATCHING TROUSERS - As these can ONLY be fitted in person. Comes complete with the authentic embroidery pattern in faux silk. MADE IN USA; Don't be fooled into purchasing on the cheap from China, especially for your fairy-tale wedding or for Comicon! Nothing, and I do mean, NOTHING, can beat quality fabrics, custom tailoring, and bespoke touches by an experienced professional. CONSTRUCTION TIME: Allow at least 2 TO 3 months for construction, AND two weeks for shipping. Please check my availability before ordering. I am often booked out a year in advance, therefore I recommend planning well in advance of your event. Secure your reservation with a 40% non-refundable deposit. FITTING: Be advised, that without a LIVE fitting the exact fit of this tailcoat cannot be guaranteed. Coat will be constructed to the exact pattern specifications. No refunds will be issued. To ensure the proper fit, you must be available to meet with me in my workshop in Washington (an hour away from Seattle). Unless you fit the size specifications listed below, and cannot appear for a live fitting, it is recommended you try to find a seamstress in your home town. Tailored clothing cannot be properly fitted without an appointment to see me IN PERSON at my workshop. ONLINE ORDERS AVAILABLE IN THE FOLLOWING SIZES AND MEASUREMENTS ONLY: Big and Tall, or customized sizes require LIVE fittings and cannot be ordered on line. No exceptions. **Non-refundable 40% deposit is required to hold a reservation on my calendar. ** Does not include trousers. 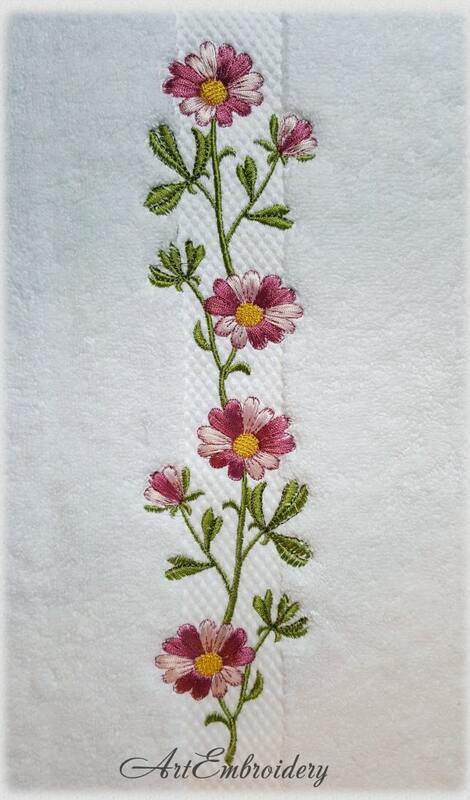 QUALITY STANDARDS: Each Designs From Time ensemble is created to meet my exacting standards, and I am a perfectionist! You may find reproduction clothing that is cheaper, but you will NOT find ANY historical reproduction clothing available on the market (outside the motion picture and professional theater industry) whose workmanship is comparable. While you may invest a bit more for a Designs From Time original keep in mind that a bargain isn't a bargain if what you're buying is substandard workmanship. My designs are clothing NOT costume. There are many Couture (hand sewn) features in all of my work. It may take more time, but I take great pride in each piece I make. The quality you see pictured is the quality that you receive. I have one of the best reputations for quality and customer service in the industry. And I stand by my work. PLEASE READ! I take (and fill) orders on a First Come, First Served basis, no matter if paid in full at the time of purchase, and whether or not the listing provides a time line for turn-around of 9 to 10 weeks. This is the maximum time offered in Etsy's format. Before you place an order for this item, please contact me about my availability as there may be orders ahead of yours. SHIPPING: Shipping listed is an approximate "guess." Actual shipping and handling costs are determined by weight and destination. A separate statement will be added upon completion of product. ** Hand-made items will have slight imperfections. *** No Returns or Exchanges on costume made clothing items, hats, or headdresses. CANCELLATION POLICIES: 99% of my clients are a dream to work with; however, there is always that ONE client out of 100 that makes you question why you are in the retail business. PLEASE understand that the item you purchased is CUSTOM, and HAND MADE to your exact measurement specifications. You will need to have a tape measure at your disposal, or the ability to have your measurements taken. If you have made a purchase in my store, I am operating under the assumption that you have READ the entire description and made note that you need to contact me about MY availability prior to your purchase. If you have not done so, and you are informed that the item will not arrive before your event due to my current workload, this is not considered grounds for cancellation. Therefore, PLEASE consider your purchase carefully before making a commitment. I do not accept cancellations after a 12 hour period, and reserve the right to refuse future service to anyone who abuses my cancellation policies. This is not selective, nor an effort to be purposefully punitive, but is simply a measure to weed out those rare clients among the 1% that buy on impulse and then cancel; OR, dispute the charge to PayPal as a fraudulent purchase in order to have their money returned because they found someone to loan them a similar item, found something cheaper, or become belligerent and demand their order be canceled because they are required to supply their dress size and measurements. (Yes - All of these are actual scenarios!) I am always available to answer any and all questions and I welcome the interaction, but please be considerate that in doing so takes away from current orders in production. When an order is canceled I have usually invested at a minimum of half a days wages, often more, due to the time I offer in consultation. Please present any questions regarding taking your measurements - which will be necessary for ALL items in my store, sizing, or shipping and delivery times, BEFORE ordering. Please be aware that should you cancel your order, there is a restocking fee of $10. If supplies have been ordered or purchased, the cost of all supplies will be deducted from your reimbursement whether or not they might possibly be used in the future for another client. 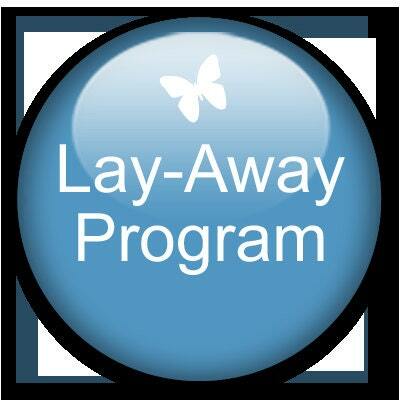 Also, those who cancel after the 12 hour period, and are using my Lay Away program, will lose their 40% deposit. Because my schedule stays booked out often a year in advance, a reservation is necessary. Your deposit is a commitment that I will not accept any other orders for that time slot. I turn away commissions regularly due to my full schedule. When/If you cancel at any time in the interim between your deposit date and the date construction is to begin, I am essentially losing customers/commissions that could have been booked in that time slot. This is the reason I ask for a non-refundable deposit. It is unfortunate that these policies have become necessary, but are the result of abuses perpetrated by the 1%. I SINCERELY THANK YOU FOR YOUR UNDERSTANDING AND COOPERATION. ALL of our GOWNS and accessories are one-of-a-kind couture, and custom drafted to fit your personal measures! Most vendors on Etsy offer pieces in multiples; however, we do not repeat the same gowns over and over. Rather, we will take a style you like and customize it for your personal tastes. All of the samples you see listed in our store can be personalized. You dream it; we'll create it! How does the Layaway option work? With a 20% non-refundable deposit, you can reserve a slot on our calendar. The remaining balance can be parceled out into six (6) automated monthly payments via PayPal. We've lowered our deposit from 40% to 20% to make it more affordable for our clients. Details are included in a contract for your protection. What's your lead time for commissions? We are blessed to stay busy! Our calendar is filled at least 8 to 10 months - or more - in advance. It's best to give us NO LESS than 6 months advance notice, but optimally longer! - especially for bridal gowns and highly detailed ensembles. Depending on the intricacy of your gown commission it can take up to 12 to 14 weeks just for construction. Because our pieces are highly detailed with custom embroidered fabrics and beading, we need every second! We squeeze accessories and corsets into our gown commission schedule and usually need no less than 3 months advance. It is best to inquire before ordering. We will make every effort possible to assist in your deadline. We will ship outside the USA - However, because our clothing is customized there will be added shipping expenses. We work off a "body cast" created from Painters Tape and Cellophane wrap which must be created in your era appropriate corset (for women). This cast is shipped to us at the customer's expense. Any customs fees or taxes are the responsibility of the client, as well as any insurance. I love this gown! - - How much is it? All of our gowns are priced in the listing. The listing you see is for the labor involved to create the SAMPLE pictured. Unless specified in the listing details (please make sure you read them) all listings are priced for LABOR ONLY. 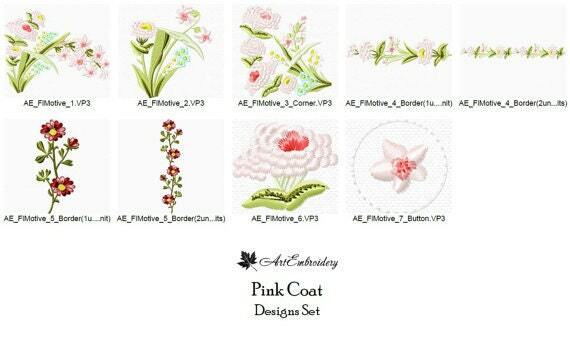 Fashion fabrics are provided by the client. We offer a cost breakdown in most of our listings. It is worth noting that our gowns are of the highest quality, worth three times the amount shown, if we were to price them at an hourly wage. We make every effort to work within your budget, but many times we are earning less than $7.50 an HOUR! The average seamstress asks $20 per hour. We are passionate about costuming and want to share our talent with as many clients as possible, but our prices stand as is. Do you take commissions for 18th and 19th Century as well? YES! YES! YES! We are well versed in the construction and fitting for other eras, namely 18th Century! Our niche has been 16th Century, but we ABSOLUTELY can create men's and women's ensembles for other eras, to include 1940s Vintage. In fact, we appreciate the divergence as we stay so booked in the 16th Century we don't' have the opportunity to "play" with samples. Added Value Service for BRIDES! We have carved out a niche for highly detailed, custom fit/drafted bridal gowns (historical themed). Because this gown is the highlight of your wedding and there are too many HORROR STORIES we hear from our clients who have used other, less reputable (but cheaper) vendors here on Etsy, we offer live, personal fittings anywhere in the United States or Canada. If you wish to avail yourself of this service, we will attach the cost of our flight and hotel to come to YOU! No more guess work. No more disappointments or risk of ordering your gown on line. We will shop for the best flight prices - flying coach - to help keep your costs at a minimum. I ordered a gown with another vendor and was SO disappointed! It sickens us, but even among those who are viewed as scions in the historical costume community have, unfortunately, been less than honest in their commissions: i.e., accepting a client's money and fabrics, only to ghost on them, or failure to meet your deadline. Unfortunately, this happens all too often. At Designs From Time, we have built our reputation on Customer Service, Excellent Communication, Quality Construction, and INTEGRITY. We invite you to seek references from our past clients! There is absolutely NO EXCUSE for these disreputable vendors. NONE. We WILL NOT take your commission (and money) unless we can GUARANTEE delivery by your needed deadline. We would rather lose a commission than risk your disappointment.